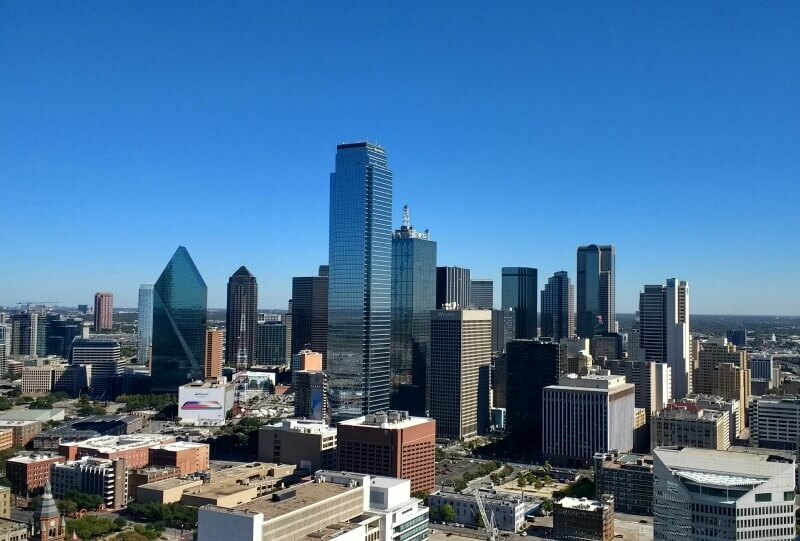 I recently had the opportunity to travel to Dallas for a work conference. I was expecting cowboy hats and country music, to be honest with you. The city wasn’t at all what I expected, and I mean that in a very positive way as I’m not a fan of country music. What I experienced was history, culture, great food, and a respect for others that was sometimes enshrined in public monuments. If you’re headed to Dallas, I highly recommend the CityPass as a way to save a bunch of money on attractions. It’s only $48 for adults and $32 for kids, and gets you into the above places. That saves you 40% compared to the normal cost of admission. I was initially super ambitious and thought I would hit all four of my potential options, but time constraints kept that number down to two. I was also downtown without a car, so distance was another thing that contributed to my choices with the limited time I had. I would definitely go back to see what I missed, though, because what I saw was pretty impressive. The very first day we got into town, some friends and I headed to the Grassy Knoll and Sixth Floor Museum. JFK was a great leader who was taken far too soon, and learning more about the background behind that fateful day was at the top of our to-do list. 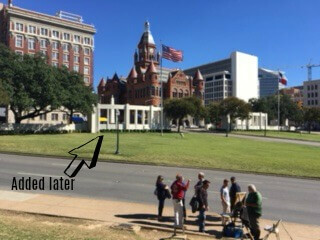 I made another 360 video for you guys at the Grassy Knoll so you could see what I did first hand. Before I show you that, I just want to orient you a little bit. Photos from this section are courtesy of Jana Says. The street you’ll see directly in front of you is Elm Street–the road the motorcade was driving down when it happened. 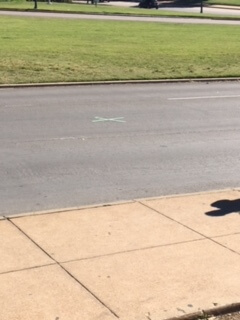 There’s an “X” where the fatal shot hit the president. You’ll be able to see this up close a bit over halfway through the video. At the very beginning of the video (and throughout,) the building behind you is the Book Depository. This is where Lee Harvey Oswald supposedly set up shop. He was an employee there. The story is he was on the sixth floor–hence The Sixth Floor Museum. We’ll get to that in a minute, though. And here’s the video. You can click and drag to look around from your PC or phone, but it will be best viewed through a VR headset. If you’re going to Dallas, I highly recommend checking out the Sixth Floor Museum–and actually doing the audio tour. The audio tour takes you through the culture and politics–both national and local to Dallas–that surrounded JFK’s presidency. It gives you an appreciation for his policies and helps you understand why some people in Dallas weren’t too keen on them. It also takes you through the whirlwind investigation into Lee Harvey Oswald, and even explores alternate theories. I was in Dallas when the JFK papers were released, and so far there hasn’t been any new huge revelation, so everything I learned was current even with the release. I didn’t really have a horse in the game when it came to the assassination before this trip. Maybe the conspiracy theories were right. Maybe they weren’t. I didn’t know enough to make an educated guess. 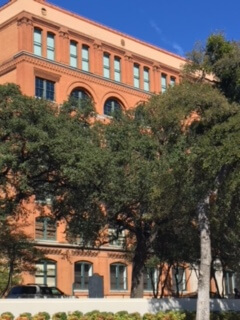 After visiting the Sixth Floor Museum, I’m convinced Oswald was set up in some way. That the events that happened that day didn’t unfurl the way the official story tells us. But when you visit, you might walk away with a different conclusion. Definitely a must-see. Our last day in town, we visited the GeO-Deck at Reunion Tower. It’s an observation deck. We expected to go up, look around, be like, “These are some beautiful views!” and then be on our way. It was so much more. It really blew us away. First, they take your picture when you arrive and green screen different skyline/tower backgrounds in. You get a free digital copy, which we were surprised by and took advantage of. You could also order upgrades. The elevator to get to the top has a window, which was breathtaking on the way up, but I did start getting a little motion sickness on the way down. Up at the top, the views outside are breathtaking. 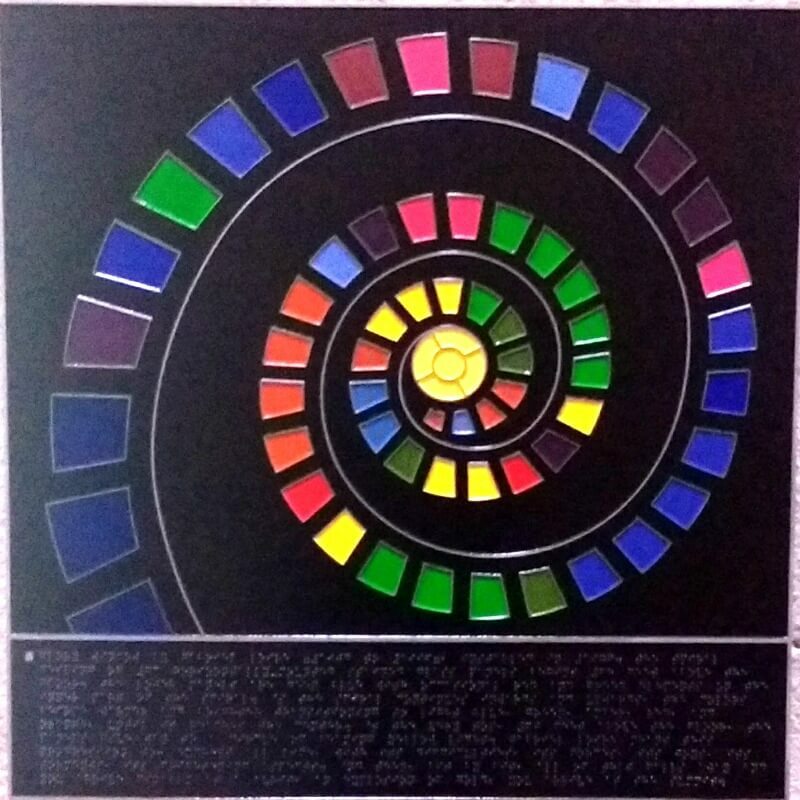 There is a sphere built around the GeO-deck, constructed of a bunch of triangle frames. Aim between those frames and you get some amazing shots. Because Dallas is so flat, you can see for what seems like forever. When you go inside, there’s a lot more to do, too. There are activity tables for kids. Then there are banks of touch screens along the edges so you can learn more about what you’re seeing. For example, we had an amazing room the end of the hall at our hotel with sweeping views of the city out of panoramic windows. We did nothing special to get this room. We just lucked out. Outside, I could see what looked like a Pegasus–a symbol I had grown up associating with Exxon-Mobile–leaping from the top of a building. I saw more of these Pegasuses (Pegasi?) throughout the city during our stay. I wondered if there was a connection. There was also a rotating restaurant above the observation deck that we heard rave reviews about, but we had already set up other dining plans. While the rotating restaurant did sound amazingly cool, I’m glad we ended up sticking to our original plan. We went to RJ Mexican Cuisine, and it was so good. It had a higher-end vibe–especially with food presentation, but I went in with jeans and a hoodie at lunch time and felt perfectly comfortable. I was insanely hungry, so I didn’t obsess over food prices like I usually do, which is really odd behavior on my part. I was kind of dreading the bill. 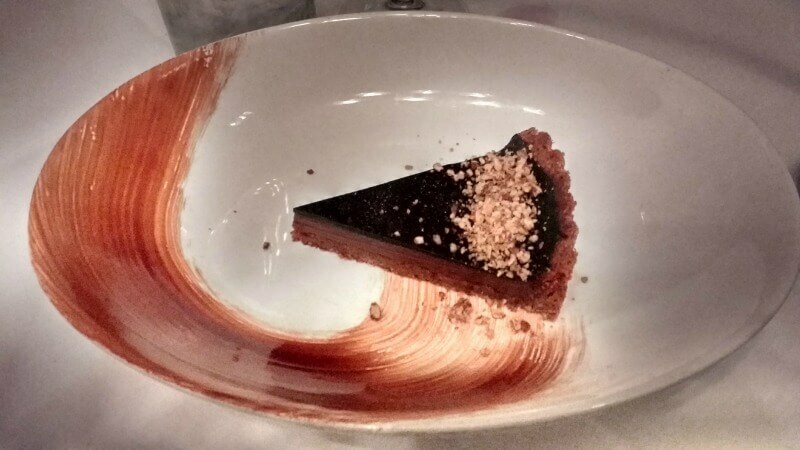 But when it came, it was reasonable: somewhere between $20 and $30 for some of the best food and service ever. 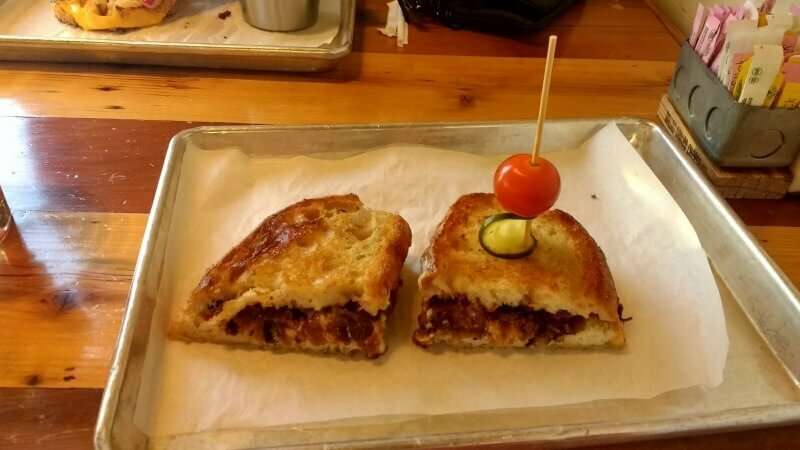 Another not-crazy-expensive restaurant we tried out was Dallas Grilled Cheese Company. It was also great. This place felt like a hipster hangout, and encouraged you to get adventurous with your food. They had a ton of different grilled cheese menu options that essentially had a bunch of add-ons cooked into your sandwich. Crazy delicious! 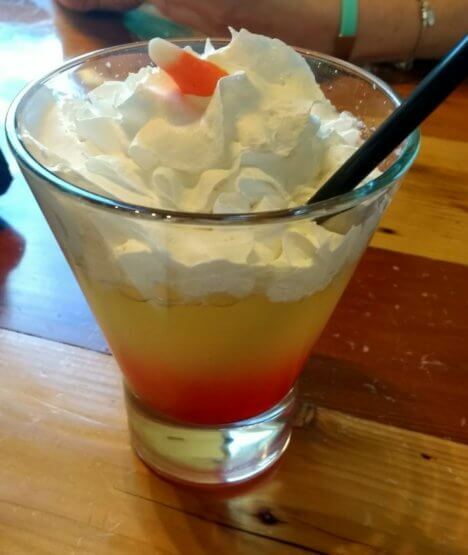 Also, they had a Candy Corn Cocktail, which was as unbearably sweet as you’d expect it to be, but also awesome because it exists. I got invited to a few dinners while I was at the conference, and they fed us so well! CFSI took us to the Ritz-Carlton, which had an absolutely stunning private room with gorgeous views of the carefully curated courtyard. The food wasn’t half bad either. Understatement. I also got to meet up with my friends at CreditRepair.com at the dinner they hosted at Dallas Chop House. Everything from the bread to the steak to the dessert above was amazing! I definitely did not leave hungry. 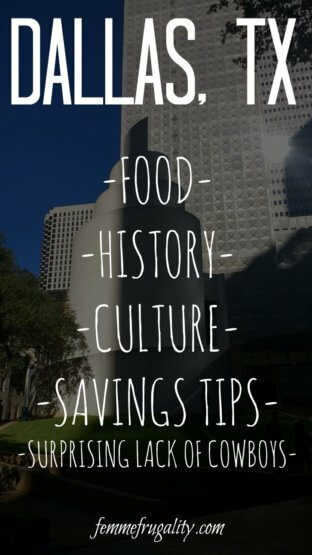 Before I went on this trip, I explored a lot of free things to do while I was there. Dallas has no shortage of them. My absolute favorite, though, was Thanks-Giving Square. Located in the middle of downtown, it’s a nondenominational oasis where you can reflect and exercise gratitude. This may sound silly, but the second I walked into the courtyard I felt this rush of peace. After an extremely hectic week, it was a more than welcome feeling. There were multiple man-made waterfalls spilling over rocks or cement walls. There were gardens under the shade of trees where you could sit for a moment of meditation. There were quotes everywhere quoting various scripture from all kinds of world religions, encouraging visitors to demonstrate gratitude. There was this feeling that the undercurrent of religion–stripped of dogma and the stories that we choose to believe–was present. That undercurrent that helps us tap into what makes us human, helps us find peace even in moments of great conflict, and helps us figure out what is right and wrong when we’re faced with a difficult decision. That was the undercurrent that was present. It’s a beautiful thing to experience. Perhaps the most impressive part of Thanksgiving Square was the Chapel. 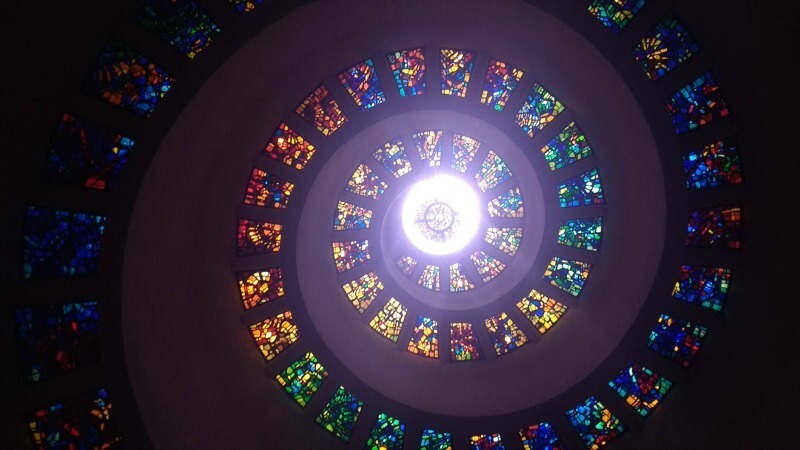 It spirals around like a nautilus–upwards towards the sky. Inside, the roof is made of stained glass windows, which are made accessible to the blind with a bold, tactile plaque on the wall. In the middle of the room, flanked by a few chairs, is a massive, marble cube that serves as a nondenominational altar of sorts. 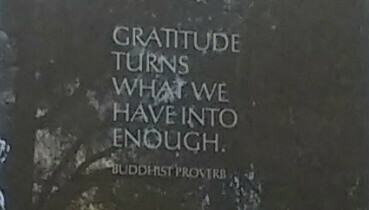 On the wall is a gratitude wall, where visitors can write something they’re thankful for. A ramp spirals up the inside of the building, but I’m not sure where it leads. It was closed when we visited. I really enjoyed this city–even more than I thought I would. If I were to do it again, I’d probably do Reunion Tower the first day instead of the last. It really helped you orient yourself and get an idea of all the different things you could do while you were in town. I’d also dedicate even more time to adventures around the city. So many interesting things to see, and so little time. Have you ever been to Dallas? What were your favorite parts? Would love to hear your stories in the comments! Should I Buy Auto Insurance on My Rental Car? 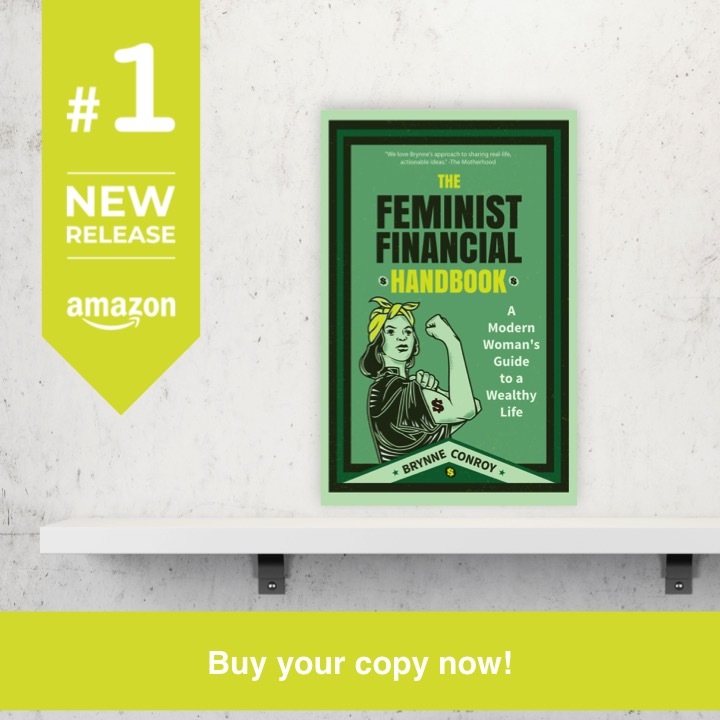 This entry was posted in travel on November 29, 2017 by femmefrugality. 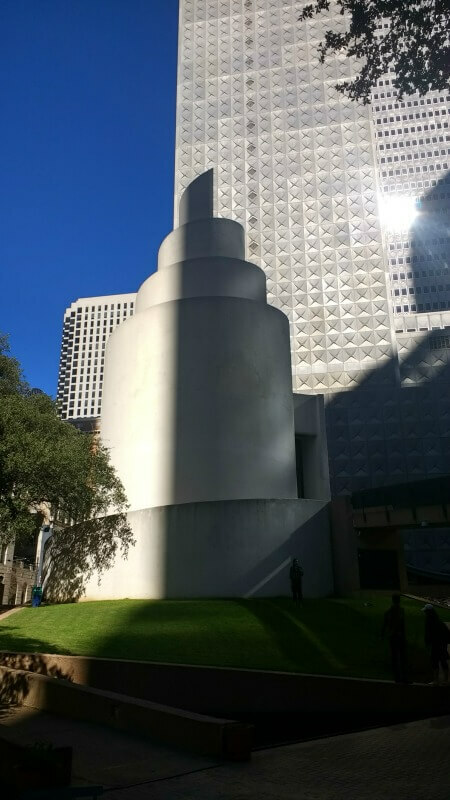 I was in Dallas a couple of weeks ago (non FinCon related) and was also surprised how much I liked the city. We did a sports weekend watching my Oilers play the Dallas Stars on Saturday and then the Cowboys game on Sunday night. It was my first NFL experience and it was intense! I thought the JFK memorial was worth seeing, and shocking how similar it still looks. I didn’t have time to check out the 6th-floor museum but really wish that I did. 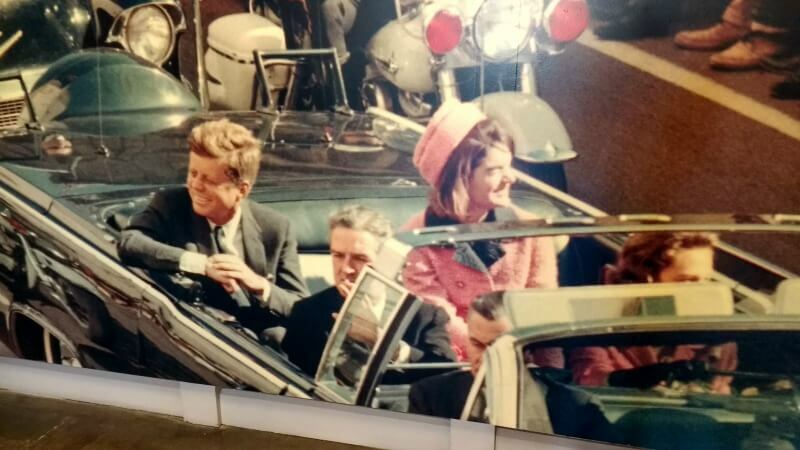 We actually came home after and watched the JFK movie…pretty neat after being there. It has stayed very similar. I wonder if it would have had things not turned out the way they did that day. I haven’t seen the JFK movie. I did see Jackie, but I’ll have to go back and catch this one. I LOVE travel reviews! I really haven’t spent any time in Dallas, but all of this sounds really interesting. I love old and/or architecturally interesting churches and chapels, so I’m super intrigued by the one in Thanksgiving Square. Sounds like you made the most of your time there! There’s another nautilus church in Missouri—the temple for the Community of Christ. Haven’t seen that one yet, but it looks like it’s worth adding to the list! We evacuated there for a hurricane once, and I’ve been there on business–many years ago. I liked the vibe of the place and was amazed how different it felt from its neighbor, Ft. Worth. Is Ft. Worth nice? I heard they have a great JFK memorial, but that’s about all I know. I’m jealous that you got to see so much of the city while you were there! I had a great time at Fincon, even without seeing the sites, though. Are you planning to head to Orlando next year? I came in a day early and left later in the day after that last night—spent even more time in San Diego last year thanks to airline ticket pricing! To be honest, I’m not planning on it at this point in time. I may come in for one night to help with the Plutus Awards, but we’ll see. I’m still doing the Pittsburgh group, though—working on getting some stuff on the calendar for 2018!